If you'd like someone to think sweet thoughts about you, send them this delightful bouquet! A graceful heart of bear grass is tied with purple waxflower, and appears to float above red roses nestled in a ruby-red glass vase. How sweet it is! 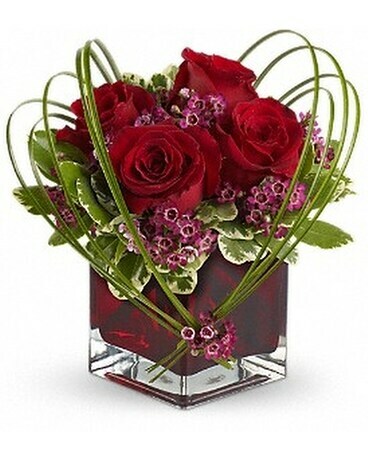 Red roses and purple waxflower accented with variegated pittosporum and bear grass arrive in a Teleflora red glass cube vase.